Spontaneous creative music, i.e. 'free jazz', usually tends toward high-energy output and daredevil antics. The appeal is like that of theater, generated in the immediacy of the moment and sometimes the physicality of the creation. The charms of spontaneous music are often lost in the conversion from 'live' event to recorded disc. 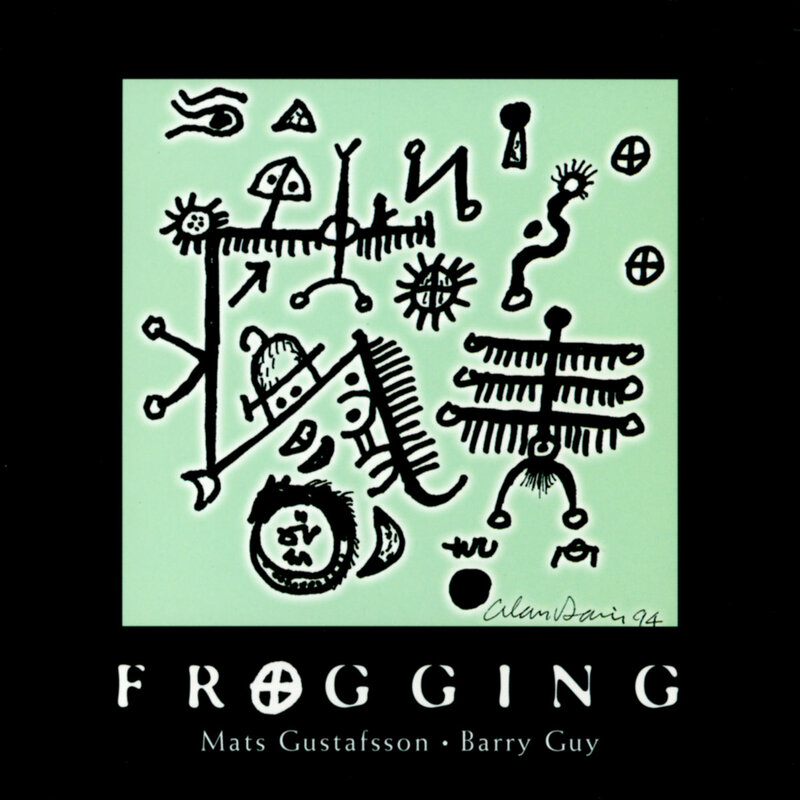 Nothing though seems lost on this recorded duo between Mats Gustafsson and Barry Guy. The Swede Gustafsson has continued to generate excellent recordings these past six years, playing an array of saxophones, flutes and the self-designed fluteophone. His association with other creative musicians include Chicago's Ken Vandermark in the FJF quartet, Peter Brotzmann's Chicago Octet/Tentet, and his own band the AALY trio which featured Vandermark on Stumble (1998), Hidden In The Stomach (1998), and Live At The Glenn Miller Cafe (1999). Last year, Gustafsson released the jaw-dropping Windows: The Music Of Steve Lacy, a solo tribute to one of jazz’s greatest soloists. Teamed with London-born bassist Barry Guy, Gustafsson has found his most sympathetic collaborator yet. Guy, almost twenty years his senior, has led a dual existence in both classical and improvisational music. He founded and is the artistic director of the London Jazz Composers Orchestra and has worked with a who’s-who of jazz improvisers including Marilyn Crispell, Evan Parker, Bill Dixon, Paul Plimley, and performed with the long standing trio of Evan Parker, Paul Lytton and Guy. equivalent of a prepared guitar or piano. With the sound of Gustafsson’s horn, you get a sense of truly human expression. The recording is also unlike many spontaneous creative jazz recordings, in that the listener has a desire to repeat the act of listening to this disc. Even though the tunes are far from melodic or transcribe-able, this free session of jazz bears repeat visits. Intriguing. This disc is a counterpart to Obliquities, Guy's 1994 duets with his longtime trio partner Evan Parker. But Mats Gustafsson, who like Parker plays tenor but also baritone sax, flute, fluteophone and French flageolet, is an even more acerbic player than Parker. His playing is even farther removed from conventional reed playing than Guy's more prominent foil, although it clearly shows the influence of Parker: Gustafsson indeed represents the post-Parker generation of reedmen. Meanwhile, this disc highlights how much Guy's bass contributes to the distinctive sound of Parker/Guy/Lytton, and how powerfully the bassist drives his mates. It is often difficult to tell which instrument Gustafsson is playing, but on the opener, Bufo punctatis (all the tracks are scientific names for frogs) he seems to be on baritone. Powered by Guy, he gibbers and squeaks, chirps and mutters, clicks and swirls. It is a bravura show for those who have already digested Parker and his fellows, and the frogs just keep coming. I think Hyla pickeringii is on tenor – sometimes Gus sounds a bit like Charles Gayle, but there is less inexorable forward motion. Scapiopus couchii features long tones, unmistakably on fluteophone (although Gayle does sometimes play his tenor up here in nosebleed range, so …). Gus clicks and screams, Guy strums and plucks on the rousing Lythodytes ricordii (a piece for baritone). Discoglossidae is almost delicate, although Gus' fluteophone (flageolet?) overblowing creates a jet effect over Guy's breathtaking peripatetics. The real standout is the longest track, Hyla gratiosa. The full range of effects – and the range is wide – of both players comes through here. Gus sounds more like Parker here than anywhere else, whirling and swirling, but still in a gruffer and rougher fashion. Later he switches to a whistling instrument, and to a goldmine of inventiveness. I'll tell you, friends, this is highly unconventional, experimental music which never ceases to fascinate. Gustafsson doesn't play notes very often, and neither he nor Guy are interested in conventional time or scales – but this is fascinating music. For the adventurous soul, Frogging is a first-class excursion into new textures and sounds.